Demonstrating the continued commitment to training apprentices the company had employed two new apprentices this year, Jacob Reid and Ifan Griffiths both of which have completed their first years training at college. Both apprentices will follow the traditional apprenticeship model and will now serve three years on the job training coupled with a day release college course. 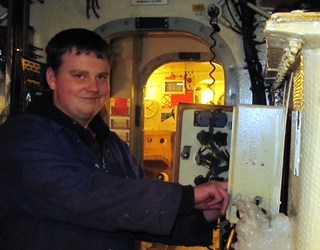 Ifan is training to be a Marine Electrician and Jacob a Marine Engineer. Both will follow a Marine NVQ level 3 qualification which will be delivered by College Llandrillo. The company has a long tradition of training apprentices with three others currently in their third and fourth years, also out of the present workforce 18% are ex apprentices.